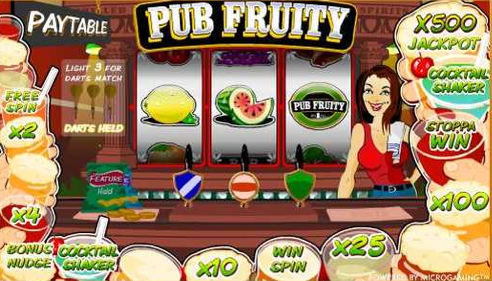 Pub Fruity is a classic Microgaming Fruit machine. It was the first they ever produced. Given its huge success, Microgaming got the confidence to produce other similar games and thus it can be described as the founding father/mother of Microgaming fruit machines. It doesn’t take astrology to guess that the game has a pub-style fruit machine fused in a pub-theme. Due to its classic nature, Pub Fruit has three-reels and a single line slot format popular in the “good old days”. The game screen is a typical traditional British pub complete with a barmaid and a game of darts. Pub Fruit has a Trail bonus game within its main game and a dart bonus in the second bonus screen, but we will look at this in details later. Pub Fruit has a barely flexible coin size range with only four coin sizes accepted. They range for ten cents to $1 with each spin costing a coin. Since the highest possible win on the main game is 250x your bet size, it is recommended that you use higher coin values to increase your winnings. The highest win is triggered when you land 3 or more Pub Fruit logos on an active line. The second highest win is a 50x multiplier that is activated when you land three Bell symbols on a line followed by a 25x multiplier that is triggered by landing three Bar symbols. The symbols have numbers that appear randomly. The random numbers are used to play the Drinks Trail Bonus game which can be seen moving anti-clockwise left to right at the top of the game screen. For every spin that displays a randomly triggered number, you are moved the same number of moves indicated around the Drinks trail. If you happen to land a win, you are rewarded for that win. If you land an empty glass, you get nothing and the bonus feature. Cocktail Shaker - You are either moved up or Moved down. The position is randomly selected. Bonus Nudge - You are awarded 1-4 nudges to disclose other symbols on the reels. Win Spin - The reels are adjusted so that you have a guaranteed winning position. 500X - The biggest win of the game. You get your wins multiplied by 500. Once you have made your choice, the three players are each awarded three dart shots at the board. If your preferred player scores the highest, you get 1000x multiplier on your bet. If your player emerges second you get a 100x multiplier on your bet and if he’s the last, you get a 50x multiplier. At the end of the bonus round, you will be guaranteed at least the consolation prize. Do the maths, make a maximum bet, and multiply it by 250 then by 500 (possible wins in the main game) then multiply it be 1,000 (maximum win on the darts). Who needs a progressive jackpot?